Most Sundays there is a market that himself likes to visit. It’s not too far from home, as the kids would say it’s “a spin”. Normally he rambles around with the kids and sometimes picks me up bits for photographs and at the end of his stroll he always drops by the vegetable stall. Most of their vegetables are either grown in the next county or sourced fairly locally and they are cheap. Day 18 of my Christmas with Caitríona series is a classic Christmas recipe! On Sunday he couldn’t believe his luck when he got a big red cabbage bigger than his head (this is very big) for €1. Score! He also picked up buckets of other vegetables including some fresh kale, carrots, apples and parsnips for under a fiver. 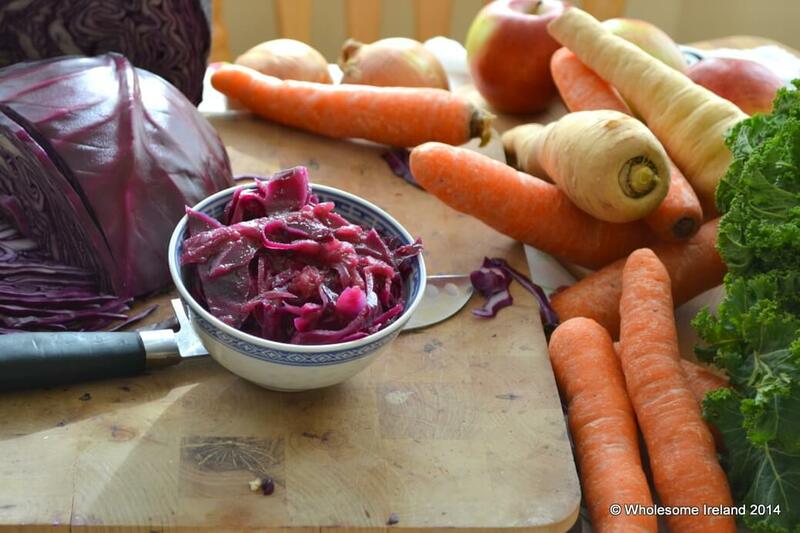 What better side dish to put with turkey than braised red cabbage? It’s lovely hot or cold. In fact, I had some cold today with some cheese on toast for lunch. Melt the butter in a large saucepan on a medium heat. Sprinkle in the ground spices and stir for about a minute so that they toast in the warmth. Add the apples and coat them in the spiced butter. Stir around for 5 minutes until they soften. Take the cabbage and add it to the saucepan, stir so it’s mixed with the apples then add the sugar, vinegar and water. Stir well until the sugar dissolves. Turn the heat to medium low, cover the saucepan and simmer for 60 minutes, stirring occasionally so that it doesn’t stick to the bottom of the saucepan. Bear in mind that we are a low-salt family so I don’t add seasoning. You may like to add a half teaspoon of salt with the sugar. Braised cabbage can be eaten immediately and is a great side dish with pork, turkey or game. Alternatively spoon the cabbage into a sterlised jar and allow to come to room temperature before sealing. It will keep in the fridge for up to 2 weeks. Looks lovely Catriona. I like the addition of the spices. Mmmmmm, red cabbage – our traditional Christmas Dinner accompaniment (German background) and I wish I had it more often!!! Oh lovely do you normally have it braised or pickled? Looks deliciously red and easy to make. Will try with porc chops or turkey.